I was reminded of why applying blind is such a reckless strategy when a mom contacted me after her husband heard me give a college talk at a posh hotel in Los Angeles. Her son had gotten into Syracuse University, a private school in upstate New York. The kid is super excited, but the parents are stressing. Since tuition and room/board at the university costs nearly $53,000 and books, travel and incidentals will boost that price, that would leave room for Syracuse to give this student some need-based financial aid or a merit award. But the teen got nothing. When I heard this, I asked about the teen’s academic profile and the mom said he had about a 3.4 GPA. I’d suggest that the student’s academic profile is the problem. Most schools give their best awards to the students who will help them move up in the US News & World Report rankings. At this school, a student with a 3.4 GPA isn’t going to do that. When I checked the average grade point averages of Syracuse’s incoming freshman at the College Board, it showed that 63% of the students had GPAs of 3.5% or higher. A 3.4 GPA isn’t special at this school. I then checked with the federal College Navigator and noted that 71% of students at Syracuse receive institutional grants from the school. Consequently, it’s not surprising that a child that was close to the bottom third of the class would receive nothing. The boy also didn’t capture money at any of the other schools that he applied to, which is unusual when you consider that two-thirds of college students who attend state and private schools receive some type of grant or scholarship. What’s more, 85% of students who attend private schools receive a price break in the form of in-house grants. What about a kid who was accepted to IU as an out of state transfer student but has no money. Her mother, who she hasn’t lived with all year, is on welfare. Her father died 2 years ago when she was entering her senior year of high school. She has been living with an older brother who has blown through the insurance money that was left by her father (she was not given any portion of that) and she has been working at a retail store and went to community college this past year. She desperately wants to strike out on her own and get an education because her so called “family” is draining her. She has accumulated appx. $10,000 in scholarship/grants/federal stafford loan but it is a far cry from what she needs to be able to attend IU. She has been turned down by Chase, etc…for student loans because she doesn’t have a co-signer and has no collateral. The poor kid is desperate. She picked IU because she likes the school, it offers what she is interested in studying, her boyfriend goes there and she has a good relationship with his family. However, his family has 2 kids to put through college and can’t afford to help financially. Any suggestions? Which school at Syracuse University did he get accepted into. The acceptance rate for the Newhouse School of Communication is about 10%. That certainly could have had an effect on this student’s lack of award. My own daughter attends Syracuse’s Newhouse School and did not get any merit awards with a 3.7 gpa. Our family’s EFC,however was much higher. She did get partial scholarships a few other privates, but her heart was set on Newhouse. The teenager was accepted into some kind of sports marketing or management program. A lot of schools either have calculators or tables that will show what kind of academic award you would be eligible for. It’s usually some combination of test scores and gpa/class rank. Southwestern University and University of Dallas are two examples.At Southwestern a 3.4 with an 1150 SAT will get $9,000. I don’t know of any exact method. Looking up the common data set for each school would be tedious. You could try searching the IPEDS data for average net price by family income and then narrow down the schools from there. And while GPA and test scores are the obvious ways of getting merit scholarships, I know many homeschoolers qualify for merit awards without any specific gpa but just strength of their activities. What about a kid with so-so GPA (3.5) but a great ACT (99th percentile)? Are schools willing to give merit $ to draw a kid with that ACT score? I have read your book so many times, I bet I can answer the last question from Beth. If they prove to be accurate estimates, I would head for the college’s net price calculator and punch in the 3.4 when asked, as well as the SAT score. They will give an estimate of how much money they will give out for scholarship. 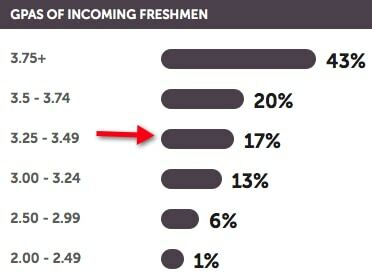 Another way is to look up the college profile and look at last year’s incoming average freshman GPA. My daughter received money, I’m sure in part, because her GPA was higher than the 3.25 average that the school was receiving. I am off to Seattle to visit my brother and I plan on giving a mini “O’Shaughnessy” seminar for his nephew. I will definitely be telling him to buy your book. I tell everyone. Thanks Michelle and Bruce for the great advice. After seeing the comments, I figured it would be worth it to write a post tomorrow on this same subject. Stay tuned. Oh and thanks Bruce for recommending my book. 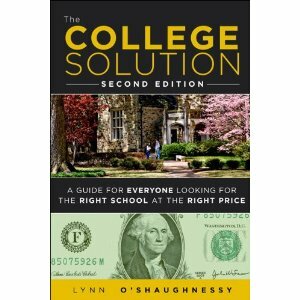 For folks who have read the second edition of The College Solution, I would LOVE for those who like the book to write a short blurb on Amazon. You write: “Ironically, there would have been plenty of private schools that would have given this teenager a price break.” What is the best way to find colleges that offer merit aid to 3.4 gpa students? I’m sure that most of your readers are grateful for having your advice before making a mistake similar to the family you describe. That is, widen the net, research, get past the lure of big name universities and focus on the overall fit for your child and family. I have plenty of anxieties about my son going off to college in a year, but thanks to your books and blog, and the resources you recommend, I’m pretty clear on what to expect financially. Thanks Denise. I’m so glad that my blog and books have helped you. Please spread the word and good luck with the college admission process. Being an empowered consumer should definitely help!